These moments of breakdown, or “object death” occur repeatedly throughout Beowulf, in particular when swords fail to function in combat as blades. Weapons play an important role in Beowulf: swords often receive names and are imbued with agentive characteristics. This agency is demonstrated throughout the narrative as swords both give aid to the warriors who wield them and “choose” to fail their users during key moments in battle. The roles of the three swords—Hrunting, the giant’s sword, and Nægling—and the object deaths that they undergo will be examined in this essay through Brown’s lens of thing theory. Humans and swords are repeatedly placed in apposition to one another in Beowulf. This ongoing comparison between human and object agents grows increasingly complex as the use for swords in combat breaks down and their identities mutate into other states of “thingness”. Hrunting, the giant’s sword, and Nægling all become actors in and of themselves, each possessing a narrative that exists outside of and prior to the action in Beowulf. The transformation within a literary text of “a dead commodity into a living work…shows how inanimate objects organize the temporality of the animate world” (Brown 16). The timelessness of the swords and other objects in relation to the human actors in Beowulf serves to strike home the mortality of the human elements of the poem. Particularly within the material culture of Beowulf, items not only serve their intended purpose within a community, but they also act as tokens of reflection and remembrance: their presence prompts onlookers to speculate about their pasts and about the uncertainty of their futures. The repurposing of inanimate objects to serve as standards of immortality against which human temporality is measured is nuanced in Beowulf. In a narrative in which these objects are treated as semi-autonomous agents and in which they have their own histories, their identities as objects are inconstant. Hrunting, the giant’s sword, and Nægling all meet some form of a material death when they fail to act as blades, losing the characteristics that defined them based upon their functions as swords. These now-useless swords are reborn as items of reflection within the Danish and Geatish societies. They become, for all intents and purposes, new things. R. Hall explores the various potential translations for the word hord in line 1520, where it is used to describe the sword Hrunting.2 Although most editors alter the line to read “hond sweng ne ofteah” in accordance with the changes proposed by Moritz Trautmann (Hall 2), Hall argues that the line should remain “hord swenge ne ofteah” (1) as it appears in the original manuscript. Although hord is not used to describe swords elsewhere in Anglo-Saxon literature, Hall posits that the poet of Beowulf is especially skilled in his use of language and is intentionally playing with the multiple meanings of the word hord with reference to Hrunting (1). When reading the line as hond sweng “battle-sword” (Hall 2), a layer of poetic imagery is lost—Hrunting is treated as nothing more than a sword in the most literal sense. However, as hord swenge, Hall suggests that the poet might be pointing to another potential meaning of the word hord: “treasure” (13). The descriptive language used for swords and other forms of armour or weapons throughout Beowulf mirrors descriptions of treasure hoards; they are glittering, shining treasure (Hall 13). If one accepts Hall’s proposed transliteration, then the Beowulf poet is using wordplay to add depth to an Anglo-Saxon understanding of material objects. The sword Hrunting not only fulfills its identity as a sword, but its value is also recognized beyond its material functions. Because the average Germanic warrior carried a spear in battle, a sword would have been seen as a “sign of wealth and symbol of rank” (Hall 9). Serving as both a weapon and as a treasure (that is, a signifier of cultural status), Hrunting moves beyond the bounds of its object status and becomes one of Brown’s things, those objects that exceed “their mere materialization as objects or their mere utilization as objects” (Brown 5). This process is “the magic by which objects become values, fetishes, idols, and totems” (Brown 5). Hrunting’s value conveys Beowulf’s hierarchical status within Germanic society, and Hrunting’s effectiveness as a blade is predicted to prove vital, even treasurable, as it serves Beowulf in his heroic career. As Beowulf reveals during his rebuttal of Unferth’s speech, Unferth is also guilty of far worse crimes than cowardice and envy: he is a kin slayer. Beowulf states, “You killed your own kith and kin, / so for all your cleverness and quick tongue, / you will suffer damnation in the depths of hell” (Heaney 587-89). This crime not only calls into question Hrothgar’s ability to choose appropriate retainers, it also draws close ties between Unferth and Grendel. As the descendent of Cain (Heaney 104-14), Grendel is a member of a clan of outcasts, forever sentenced to exist outside the bounds of human communities. Although Unferth is not thrown out of Hrothgar’s company, this smear against his character continues to follow him, and his legacy, which is implicated into Hrunting’s identity, carries the mark of his sin. After the attention the Beowulf poet dedicates to the seemingly immoral and un-heroic character of Unferth, it should come as no surprise to the reader that Hrunting ultimately fails Beowulf. As he attempts to use Unferth’s blade against Grendel’s mother, the “battle-flash would not bite, / harm her life, but the edge went weak / in its lord’s need” (North et al. 1523-25). Although previously Hrunting accomplished many feats, it now fails Beowulf: “First time, then, / for this precious object to fail its test of renown” (North et al. 1527-28). The lines in which the failure of Hrunting is described are juxtaposed with a description of Beowulf’s superior character: “[Beowulf] revived his resolve, by no means slow in valour, / mindful of his exploits was Hygelac’s kinsman” (North et al. 1529-30). Hrunting fails Beowulf because it carries Unferth’s stain: it belongs to that society of outcasts of which Unferth, Grendel, and Grendel’s mother are members. If Beowulf were to wield Hrunting successfully, it would point to some character flaw of his own, associating him with that same group of sinners. Johann Köberl emphasizes the difficulty Hrothgar encounters when attempting to decipher the characters on the hilt of the giant’s sword, highlighting the peculiarity of their unintelligibility (121).4 As an answer to this puzzle, Köberl connects the history of the giant’s sword with the story of King Heremod, who is referenced briefly in the speech Hrothgar gives to Beowulf when Beowulf presents him with the hilt of the giant’s sword. 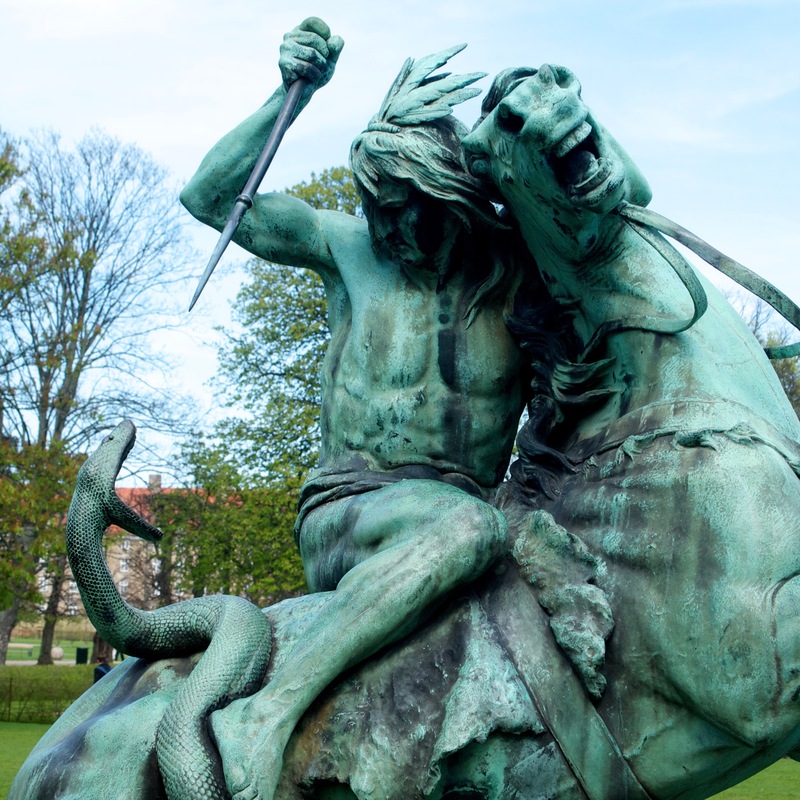 While this connection is tenuous and speculative, Köberl’s analysis does demonstrate the multiple roles that the giant’s sword plays in the narrative: firstly, it has a history of its own that predates the cultural memory of the Geats and the Danes. At the moment of Beowulf’s greatest triumph thus far in a career of heroic exploits, the sword serves as a reminder of Beowulf’s humanity and ultimate mortality. Secondly, the inscriptions on the sword point to the cultural utility of art. Every item may be a token that reminds humans of something else; items acquire dual identities through both their intended purposes and through their functions as mnemonic devices for their communities. James Paz’s reading of the purpose of the giant’s sword hilt in Heorot is more nuanced than Köberl’s.5 Paz acknowledges his use of thing theory in his analysis of the roles of Hrunting and the giant’s sword, and suggests that the death of Æschere, Hrothgar’s “rune-knower and advice bearer” (Paz 231) “provokes an anxiety in the text about ‘things’ that defy human interpretation and convey monstrous, marginal, or altogether unknowable messages instead” (Paz 231-32). Acts of reading or interpretation bind communities together (the riddles in Germanic literary cultures are evidence of this practice), and the loss of Æschere, the one figure in Heorot who may have been able to interpret the inscription on the sword’s hilt, brings strife into Heorot and the Danish community as a whole (Paz 232). The inscription’s refusal to be interpreted unsettles the Danes and destabilizes their already precarious society. In pinpointing why exactly the mystery of the sword’s hilt introduces such anxiety into Heorot, Paz points to the “alien history” (232) of the sword and the lineage of giants and monsters that it traces. Having been brought into the kingdom of the Danes, the sword implicates Hrothgar and his people into the same monstrous narrative. The power of the Danes has been declining ever since Hrothgar was unable to rout Grendel and Grendel’s mother from his kingdom, and the scene in which Hrothgar imparts his kingly wisdom to Beowulf after Beowulf presents him with the sword hilt signals both the moment in which the Geats usurp the Danes’ power and the beginning of Beowulf’s transition from hero to king. In this moment, the giant’s sword hilt is introduced into the narrative as a “self-reflexive literary device” (Paz 233), warning the audience about the dangers of attempting to interpret the past. Now that the kingdom of the Danes and Hrothgar himself have become past ideas in the narrative of Beowulf, “the hilt embodies a concern over how stories of the past are conveyed to future audiences” (Paz 233). With the narrative presented from a perspective that favours Beowulf, Hrothgar’s story is transformed by the poet for an Anglo-Saxon audience who sees him and his legacy as a recent addition to the “alien, monstrous past” (Paz 233). When Beowulf kills Grendel’s mother, he effectively destroys the giant’s sword as well—the blade melts away like ice after it encounters her. This hilt, bladeless and useless in combat, “comments on the anachronism and obsolescence of a bygone ‘heroic’ age” (Paz 249). As both Brown and Paz note, outdated objects serve to reassert the temporality of the animate world, and Beowulf is a work that concerns itself largely with questions of temporality and cultural transience. Within the narrative framework, nearly every major battle occurs at the crux of a cultural transition, as one people transfers their status of cultural and military superiority onto another. The fact that the blades Hrunting, the giant’s sword, and Nægling all migrate from one society into another only to be destroyed in the hands of their new owners demonstrates that the heroic age itself is coming to a close. The inscrutable hilt of the giant’s sword, which prompts dark reflections on the temporality of human societies, “dwells in the margins of a human community” (Paz 249). The final sword to be wielded by Beowulf and to undergo an object death is Nægling. Unlike Hrunting and the giant’s sword, Nægling has been present with Beowulf throughout many battles, and has achieved a rich reputation as a result: “The treasures that Hygelac lavished on me / I paid for when I fought, as fortune allowed me, / with my glittering sword” (Heaney 2490-92). The poet’s emphasis upon Nægling’s famed reputation heightens its catastrophic failure during the Beowulf’s fight against the dragon; Nægling is imbued with agency and receives the blame for Beowulf’s handicap during this fight. When Nægling fails to pierce the dragon’s hard skin, the poet writes, “No boasts of triumphal glory / for Geats’ gold-giving friend, his war blade weakened / vulnerable in violence as it never should have” (North et al. 2583-85). Culbert asserts the peculiarity of Nægling’s failure—rather than suffering from a mere mechanical issue, Nægling actively “betrays its own nature and violates its reputation for durability” (19). Nægling’s failure not only undoes its identity as a weapon, but it also fails on the level of “thingness” that is culturally attributed to it: Nægling’s status as a treasure, an item which communicates the famed reputation of its user, is called into question once it fails Beowulf. The implication in the passage quoted above is that the sword deliberately went against its own nature in order to sabotage its master. Even though Beowulf dies in battle, the poet reworks the destruction of Nægling in order to demonstrate an excess of Beowulf’s greatness. Despite its failure as a weapon, Nægling still proves to be of immense value to Beowulf, because as a result of its “choice” to fail him in battle, Beowulf’s reputation is upheld even as his strength deteriorates with age. As a thing, Nægling directs the audience’s attention back to Beowulf, to look on him with awe as he fights and dies in battle, an event that is paradoxically both a failure and a success. Throughout Beowulf, swords are elevated from the status of mere objects and are imbued with a degree of agency that places them in apposition to their human counterparts. Through the swords’ new positions as active things, a permeable boundary forms between them and those who wield them—characteristics and even historical narratives are exchanged between these objects and their owners. Even after, or perhaps because, each sword undergoes some form of object death, they continue to function within their communities as tokens of remembrance and as standards of timelessness against which human temporality is measured. The swords play crucial roles both as actors within the narrative of Beowulf and as self-reflexive literary devices as they navigate the mutability of their identities as things. Beowulf. Longman Anthology of Old English, Old Icelandic, and Anglo-Norman Literatures. Ed. Richard North, Joe Allard, and Patricia Gillies. Harlow: Longman, 2011. 5-81. Print. Brown, Bill. “Thing Theory.” Critical Inquiry 28.1 (2001): 1-22. JSTOR. Web. 5 April 2015. Culbert, Taylor. “The Narrative Functions of Beowulf’s Swords.” The Journal of English and Germanic Philology 59.1 (1960): 13-20. JSTOR. Web. 5 April 2015. Hall, J. R. “The Sword Hrunting in Beowulf: Unlocking the Word hord.” Studies in Philology 109.1 (2012): 1-18. EBSCO Host. Web. 6 April 2015. Heaney, Seamus, trans. Beowulf: An Illustrated Edition. New York: W.W. Norton, 2008. Print. Köberl, Johann. “The Magic Sword in Beowulf.” Neophiloligus 71.1 (1987): 120-128. Springer Link. Web. 6 April 2015. Paz, James. “Æschere’s Head, Grendel’s Mother, and the Sword That Isn’t a Sword: Unreadable Things in Beowulf.” Exemplaria 25.3 (2013): 231-251. Maney Online. Web. 6 April 2015.